Image Credit: USGS via Wikimedia Commons. Scientists from MIT have designed a next-generation water desalination membrane that could greatly improve our ability to extract drinkable water from the sea. Material scientists from the Massachusetts Institute of Technology (MIT) have designed a next-generation water desalination membrane that could greatly improve our ability to extract drinkable water from the sea. The membrane is composed of a one-carbon atom thick sheet of graphene. Their research about this new form of nanotechnology was published on July 5, 2012 in the journal Nano Letters. Water scarcity is a growing problem in many parts of the world. Less than 1% of the world’s freshwater is accessible for human use. 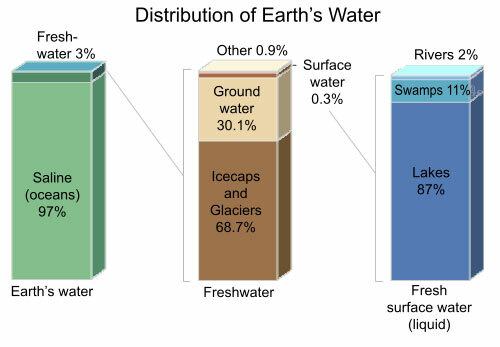 Most of the water on earth is seawater. Although desalination technology exists that can extract drinking water from seawater, it is energy intensive and costly to use. David Cohen-Tanugi and Jeffrey Grossman are scientists from the Department of Materials Science and Engineering at MIT. They were interested in determining if graphene, a pure carbon substance, could be used for water desalination. Graphene is already being used in other technological applications such as DNA sequencing. However, its potential for use in water desalination is just beginning to be explored. Read more: New water desalination technology shows promise | Human World | EarthSky.